Our family farm is located in the Lefkonas lake district in Prespes, North West Greece. 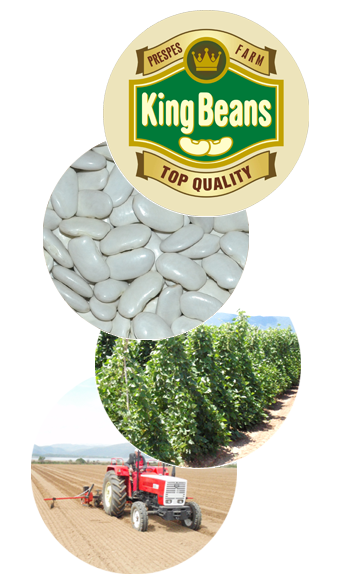 Christos Dimitropoulos, the son of Spiros, began bean cultivation for the local market towards the end of the 1930's. He watered his crops with the ancient lake water and the beans absorbed rich nutrients from the soil. In 1970, an irrigation network was created and the bean crops could cover the wider plains beyond the lake's edge - still taking advantage of the nutrient-rich lake water. Christos' son, George Dimitropoulos, saw the sale of products go nationwide. In 2010, the third generation, Christos Dimitropoulos, joined the business, working alongside his father George. The family has also introduced a new business – for three decades now it has been trading air conditioning units, heating systems, solar and solarheating systems, from a base in Thessaloniki. Investment in human resources, new equipment and an ever increasing crop area, means the company is reaping the harvest of its years as an innovative, ambitious business that promotes the No 1 Beans in Greece and the worldwide market. This all goes to show that the quality of the product is nothing but excellent. Our goal is to assist in improving the quality of life in the deepest rural areas of Greece and to help diversify the rural economy.